I shall try to read a few more titles before the shortlist is announced on 25 May at Crime Fest, but several of them are not yet available in the UK. There will be some that I shan’t read, for reasons of time or taste. Unfortunately, there is something of a Scandinavian bias, but that’s my honest opinion. It also reflects the proportion of books published in the UK during this year’s eligibility period. If I were allowed another couple, I’d choose Hour of the Wolf by Hakan Nesser (Sweden) and The Potter’s Field by Andrea Camilleri (Italy). I have chosen these because they all work well as crime novels: several of the eligible books are not what I’d call “crime novels” but are “fiction with a crime in”. I have also excluded a few which I enjoyed reading very much but which I thought were let down by their plot resolutions. But it is a very strong year; I’ve really enjoyed reading almost all of these books – it’s a pity not to be able to include Anger Mode, Burned, All Yours or Ashes……or Sweet Money, Phantom or Dark Angel….tough choices! See all my posts on the International Dagger. The definitive post on the eligible titles at Euro Crime blog. Other recent posts about this year’s eligible books are at The Game’s Afoot and Reactions to Reading. This entry was posted in International Dagger, Reading by Maxine. Bookmark the permalink. Wow – 42 of the eligibles – you are definitely the master at this. I’m thinking it will be a miracle if I make it to 20 – I’ve just started Nights of Awe and am finding it a bit odd but that’s possibly the fist person voice which I always find takes me a while to get into. I’m listening to the last of the Camilla Lackberg novels too which is fun but I must admit I am getting a little tired of the domestic side of life in the novels – seems to have been particularly at the forefront in the last two – the previous one had a good story to counter-balance but so far (about 1/4 in) The Drowning is more about carrying twins and changing nappies than it is about finding the missing person. I would offer you the proof of Hill but you would not thank me for it. I liked Nights of Awe but it jumped the shark a bit for me in terms of number of dead bodies & international conspiracy theories. The protagonist, Ariel Kafka, is a good creation. An impressive list Maxine. I’ve read 15 on your list, plus Maxime Chattham’s Carnage on Karen’s. The standout for me was ‘Midwinter Sacrifice’ and I’ve got an early copy of ‘Summertime Death’ which I’m dying to read but want to wait to nearer its publication date. Also on my list would be ‘Dregs’, ‘Winter of the Lions’ and ‘The Unlucky Lottery’ which I slightly preferred to ‘The Hour of the Wolf’ and probably Jo Nesbo. As you say, dominated by Scandinavia! I liked Midwinter Sacrifice too, Sarah, but not as much as some on this year’s list. Glad you liked Dregs, I think it is an excellent addition to the genre. Even if I repeat what others have said; that’s quite an impressive list of books read, Maxine. No major disagreement from my side. I’ve move to the top of my list of books to read the Fossum, Larsson and Hill books.My preferences so far Dregs, Temporary Perfections, Trackers, Outrage, Phantom, Sweet Money and The Quarry. Very good shortlist, Jose Ignacio! I was not as taken with Temporary Perfections as I was with the previous three, but still a good book in many ways. I liked Sweet Money, too, but for some reason it did not affect me as much as his previous one – which I chose as my winner for last year. Maxine – I am so impressed with how many eligibles you’ve read! You leave in gape-mouthed awe (and trust me; it takes a lot to do that). I think you’ve made some terrific choices for your shortlist, Scandi-leaning or not. I’m very glad that there are so many excellent eligible titles this year, too. There’ve been times when the pickings were a little slimmer but this year there are some great ones. I’m now going to archive this excellent post because there are far, far too many of these I haven’t yet read. Shame, shame! What a huge dent you’ve made in the list, Maxine! As my reading list becomes more and more crime-centric (I’m a bit burned out by other novels lately), I hope to read more than just the Nykanen. I feel a need to start at the beginning of a series, which will probably keep me from reading too many of the eligibles this year. 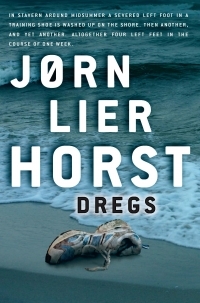 If you can get them in the US, I recommend Dregs, Anger Mode, Burned, The Summer of Dead Toys, Ashes, All Yours — these are all either standalones or first in series (Dregs is actually not first in the series, but first to be translated). Always impressive! I’ve read 10 of those you’ve read of the possible Dagger shortlist. I’ve read two of your favorites, Outrage and Until They Wrath Be Past, and I’d put them up there, too. I’d add The Boy in the Suitcase . I also liked The Demon of Dakar. I have to look at Eurocrime’s list to figure out how many I have read of the list. I don’t always read books the year they’re published so I’m often behind. For some reason, I’m not reading as much now and am trying to read a long, non-mystery book. It’s a U.S.-written -published book, but I keep looking for a dead body and a frenzied detective. But plod along I must, as I’m determined to read it. My wonderful nephew just sent me Dregs and I’ tempted to put the other book down and pick it up, but I’ll try and be disciplined. I’m sure I’ll like it. Oh, what is that pull of Scandinavian detectives? It’s uncanny. Yes, it is odd reading “non mystery”, especially when a crime occurs in one. Of course, these are titles published in the UK in translation over the period, the US pubs are often different – some sooner, some later. One non-murder mystery worth reading is State of Wonder by Ann Patchett, a U.S. author. It’s an easy read, and actually there is a mystery, “Where is the missing researcher who went to Brazil?” But there are no murders and no detectives racing for clues. Because I read mysteries, I was able to figure out the denouement, but it’s a nice vacation read. She writes well. read when published on May 24. Thank you, Simon. I am fascinated that you chose Trackers given the Swedish contingent! I loved it, too – but I think it worked better if you’d read some of the earlier books given its format of short sections about different characters. Misterioso is being published in the UK under a different title, I think later this year, so I suppose it will be eligible for the Int Dagger in 2013. I agree it will be a strong candidate, I enjoyed it very much, too. Maxine: Your reading is prodigious. I have read but one from the list of 79 which is Trackers. I was happy to see it made your short list. Do the judges read all 79? Luckily for them, no, Bill. Not all these books will be submitted for the competition – I am sure the judges will try to read all of those that are, but if there are masses of late submissions, I suppose they may have to divide those up between them….just speculation. Maxine I am stunned that you have managed to read so many. Well done! I have read only three of your shortlist of seven, but hopefully I will catch up and read all the official shortlist.